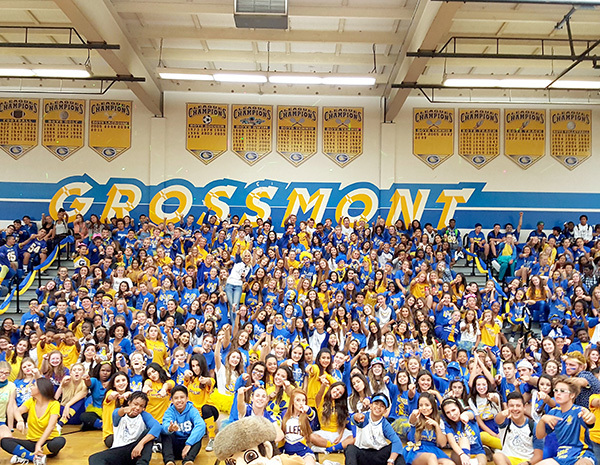 For 98 years, Grossmont High School had taken pride in its outstanding academic and athletic programs and its nurturing of students’ well-being. Over the past 10 years, Grossmont has been frequently recognized by the California Department of Education for its efforts to improve all aspects of school life. In 2009, Grossmont High School was first selected as a California Distinguished School. Additionally, two programs within the school were also honored as California Distinguished Programs: the Career Technical Education Program and the Visual and Performing Arts Program, which was the first in San Diego County to receive this award. In 2013, Grossmont High School was again recognized as a California Distinguished School, this time for its strong commitment and innovative approaches to improving student academic achievement. That same year in June, Grossmont was also honored by the California Department of Education as a winner of an Exemplary Award, which recognized schools that, in addition to high academic achievement indicated by their Distinguished School qualifications, have committed time and resources to broad-based arts education programs that strengthen students’ creativity and encourage their personal interests. In 2017, GHS received the Gold Ribbon School Award for the excellence of its student academic and emotional school-wide support programs, including GHS PRIDE (Prepared, Respectful, Involved, Disciplined, Empathetic), GRC (Grossmont Resource Center), Mentors, G-Crew (student support leaders), ASB (Associated Student Body), and for providing unlimited opportunities in and out of the classroom for students to reach their full potential. Recently, in February of 2019, Principal Dan Barnes told the staff, “Congratulations on being recognized for the third time as a California Distinguished School! We qualified to apply due to our success in all five areas of the California School Dashboard rating of its schools: suspension rate, graduation rate, college and career placement, ELA testing, and math testing. In State Superintendent Tony Thurmond’s announcement of this year’s awards, he said, “Grossmont High School implemented a social and emotional learning program to support the needs of students through leadership, celebrations, rituals, traditions, and emotional learning. To better support social and emotional learning, the school established behavioral interventions such as a time-out reflection room that provides an immediate consequence combined with a reflection on problem behaviors. As an alternative intervention to detention or a referral, students can be sent to this room by a teacher to reflect on their behavior. “Once a week, the school also teaches emotional intelligence, dealing with how to recognize, understand, label, express, and regulate emotions — with the goal of gaining confidence that will cross over to their academics, which will then result in overall student improvement. Class of 1959 60th Reunion: Weekend of Sept. 21; contact Joyce Schwartz Camiel at joycecamiel@gmail.com or 619-806-7914 or co-chair Carmen Colonghi Gaerin at cgaerin@gmail.com or 619-992-8823. Class of 1964 55th Reunion: Oct. 19; For information, email ghs64@cox.net. Location, menu, and reservation detail will be provided in a June email. Class of 1969 50th Reunion: June 29. Email Monica Taylor Erickson at monica.erickson51@yahoo.com. Class of 1970 50th Reunion: Date to be determined. For information, email Julia Yale Salinas at jsal2752@yahoo.com. Class of 1974 45th Reunion: Sept. 19 at 6 p.m. alongside the pond at Anthony’s Fish Grotto in La Mesa. Website: bit.ly/2JjkdAO. Class of 1989’s 30th Reunion: July 27 at the Doubletree San Diego Downtown. Visit our visit bit.ly/2F6IEfy. Or call 760-721-0525 or email Wendy Hodgetts Shortley at wendyshortley72@gmail.com or call 858-414-7319. Class of 1999 20th Reunion: June 29 at the Marriott Bayfront. Visit bit.ly/2XX4U4d.